Success concepts you will not learn at any traditional college on the planet! Success is predictable. It is based upon Universal Laws. Period! The laws are flawless; they work perfectly every time, all the time. However, the laws are mysterious or inexplicable. They have 'hidden truths'; they are not as clear-cut as they might seem. Mostly, they are elusive and baffling. Great success is a careful process of discovering and applying certain subtle, pure truths about prosperity. When you figure out those truths and utilise them correctly, miraculous results occur in your life. 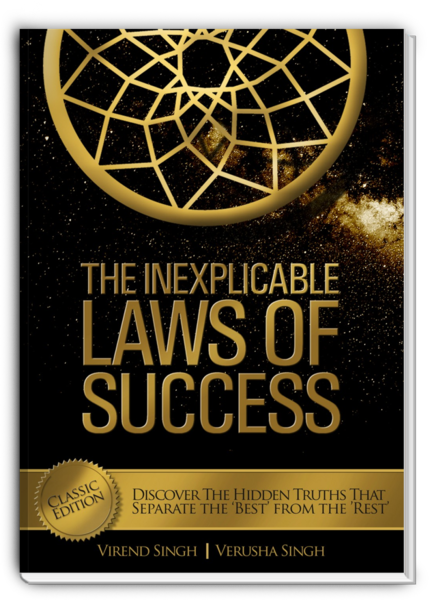 The Inexplicable Laws of Success exposes those truths and shows how they engender spectacular accomplishment. Nothing is held back. When it comes to books on "success", nowadays it is rare to find one that brings something new to the conversation. The Inexplicable Laws of Success certainly does... and in a remarkable way using innovative trademarked illustrations to explain core concepts! A book like no other, it transcends the classics such as Think and Grow Rich, As A Man Thinketh, The Science of Getting Rich, How To Win Friends and Influence People, and The Power of Positive Thinking, to name a few. It is a concise and profound book that invites ancient, but strangely advanced ideas into our lives and gives us new understandings of many timeless, pure truths about prosperity. The truth does not cease to exist when it is ignored. When you know the truth, your life will be better. When everyone knows the truth, the world will be a better place. When you read The Inexplicable Laws of Success, you experience an awakening - a dramatic shift in your vision and you see life from a completely new perspective. It feels like the search for the truth has ended and a new dimension of understanding has begun...and it's time to leave your old self behind and begin your journey afresh with a new sense of awareness. BE the change you want to see. Start a personal transformation that will forever change the world...HERE. For more appraisals, click the Reviews item (under 'The Book' tab) and also check out the Amazon Customer Reviews below.